The announcement came amid reports that the United States is increasingly flexing its muscles to counter Iran’s growing regional assertiveness and put more pressure on Tehran over its controversial nuclear programs. 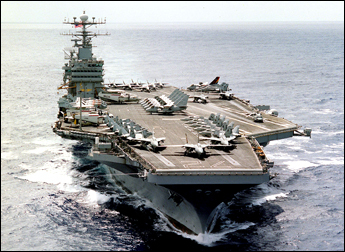 It was reported Tuesday that a second U.S. aircraft carrier, the USS John C. Stennis, will arrive in the Middle East in about one month, the first time since the U.S.-led Iraq war in 2003 that the United States will have two carrier battle groups in the region. The USS John C. Stennis, a Nimitz-class nuclear-powered carrier that has a capacity for 5,000 sailors, is scheduled to sail Tuesday from its home port of Bremerton, Washington, said Commander Kevin Aandahl of the U.S. Navy’s Fifth Fleet based in Bahrain. In about one month, the USS John C. Stennis, including an air wing of more than 80 tactical aircraft, will join Fifth Fleet forces that includes aircraft carrier USS Dwight D. Eisenhower. “This demonstrates our resolve to do what we can to bring security and stability to the region … (and) dissuade others from acting counter to our national interest,” Aandahl said. Meanwhile, U.S. forces are still holding five Iranians arrested in northern Iraq last week, who the United States says have been connected to an Iranian Revolutionary Guard faction that arms insurgents but Tehran says are merely consular staff. In a show of defiance, an Iranian government spokesman said on Monday that the country was pushing ahead with its plan to install at least 3,000 centrifuges for nuclear fuel production. In what could be a sign of the Iranian beefing up of military preparation in face of the U.S. sabre-rattling, Iran obtained new anti-aircraft missile systems from Russia. Russian Defense Minister Sergei Ivanov confirmed on Tuesday that his country had delivered the Tor-M1 missile defense systems to Iran under a deal signed in 2005 and would consider further requests by Tehran for defensive weapons. “We have delivered modern short-range Tor-M1 air defense systems to Iran. We are developing our cooperation with Iran based on the provisions of international law and if Iran needs to procure defense weapons, we are ready for such cooperation,” Ivanov was quoted by the Russian Interfax news agency as saying. Moscow struck the one-billion-U.S.-dollar deal with Tehran in November 2005 to supply it with Tor-M1 missiles. Russian officials described the missiles as air defense systems that are used only to bring down aircraft and guided missiles at low altitudes but can not strike ground targets. Interfax said that Tor-M1 is capable of simultaneously tracing up to 48 targets and firing at two targets flying at altitudes ranging from 20 to 6,000 meters.